You are currently browsing the Smash or Trash Indie Filmmaking weblog archives for the 'About This Site' category. Happy Anniversary Smash or Trash! 10 Years!!! 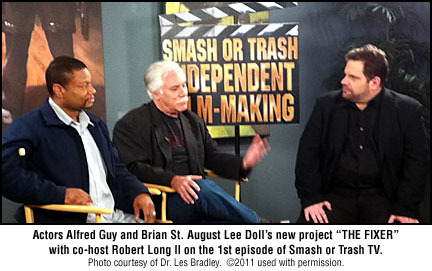 Today Smash or Trash Independent Filmmaking celebrates it 10th Anniversary. Wow! What a fun roller coaster ride it has been! So many reviews and interviews of fantastic people in the indie film business. So many opportunities to be part of the independent film scene on both coasts! So many blessed experiences. There are so many people to thank, that I really, really can’t name them here, cause I KNOW I will miss someone very important. I do want to thank my partners in crime Leanna Chamish and Mitch Klein, whom have helped me from the very beginning. 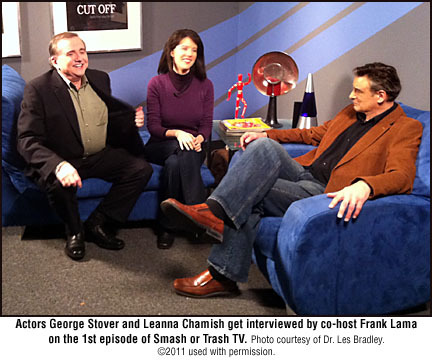 Frank Lama for being an incredible producer and co host on the Smash or Trash television program. Les Bradley for his editing know how and friendship. I am very much in debt to these people. And for everyone else that has contributed to the website, you have my gratitude. March has some great things in store for fans of indie films. I take an in-depth look into Damien Leone’s ALL HALLOW’S EVE and TERRIFIER. 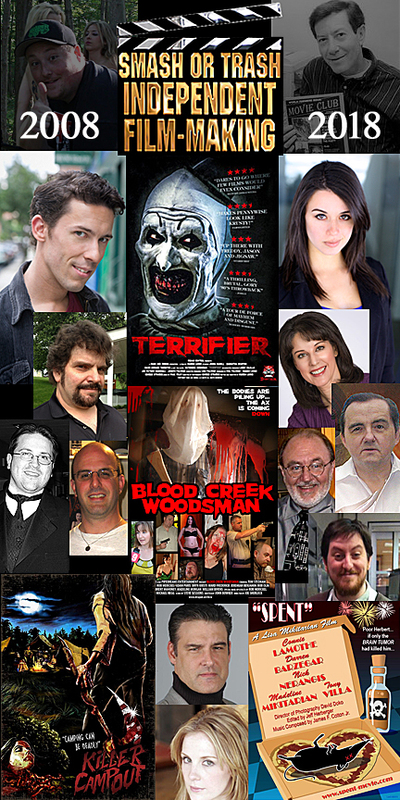 Plus I have some incredible interviews with two of the stars of TERRIFIER – David Howard Thornton and Jenna Kanell. Both are incredibly talented and super fun to talk to. 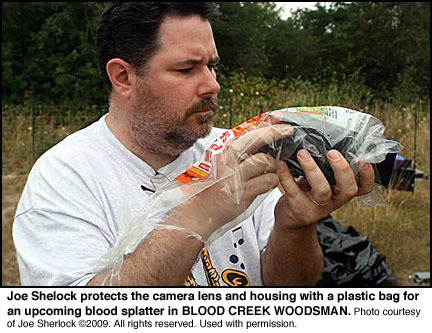 Also, I take a look at Joe Sherlock’s slasher THE BLOOD CREEK WOODSMAN. Joe has been a friend for years and it is great to see just how far he has come as a filmmaker. Smash or Trash takes a look at Brad Twigg’s KILLER CAMPOUT as well. With tongue firmly in cheek, it’s a backwoods slasher romp with plenty of blood and some fun cameos from genre legends John Russo, Herschell Gorden Lewis and George Stover. We also catch up with Lisa Mikitarian and how her LA screening of the indie comedy SPENT went. And last but not least – with the weather getting nice again we go into overdrive with the upcoming filming of MY movie – MADHOUSE MANOR. I am very proud that over the years on this site, we have branched out beyond the confines of just reviewing indie horror and sci fi. We have pushed that envelope and have covered indie dramas, rom coms, comedies, musicals and even westerns! 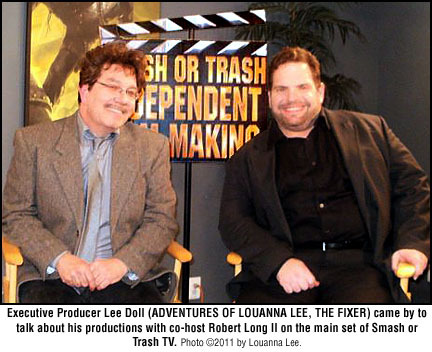 Robert Long – independent filmmaker and creator of Smash or Trash Independent Filmmaking was recently interviewed on the Kate Show – an East Coast talk show (as well as being a Lee Doll Production). 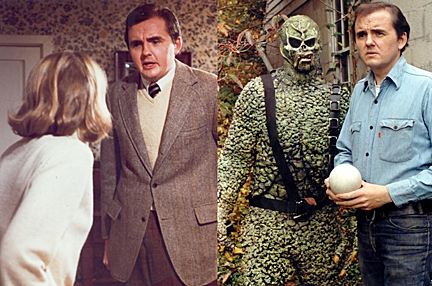 Kate talks to Rob about his career and such highlights as working in Hollywood, Bubba Ho Tep, The Fixer, The Adventures of Louanna Lee, and the films of Don Dohler. It’s a fun recap of a creative person’s body of work. LAST BIG UPDATE OF THE YEAR!!! Hello all you independent film enthusiasts! This will be the last BIG Smash or Trash update for a while because I am MAKING A MOVIE! That’s right, I have been in the business 30 years and to celebrate I’m going into production on a movie for the first time in DECADES! Madhouse Manor! Smash or Trash will be reporting on is as it happens – so keep looking at this space! Now what has been happening? Jim Wood – a huge Don Dohler fan – is having his own documentary done on his career as a front man for a band. 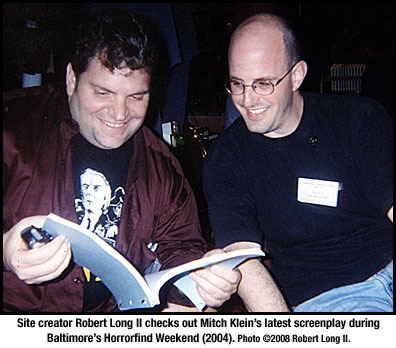 A big part of this doc includes him meeting his indie film hero – Don Dohler! They are so close to meeting their kickstarter effort. 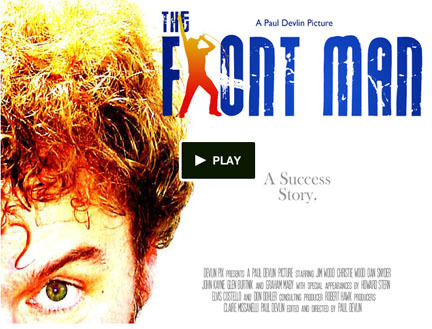 So help independent filmmaker Paul Devlin make his goal! Check it out here! 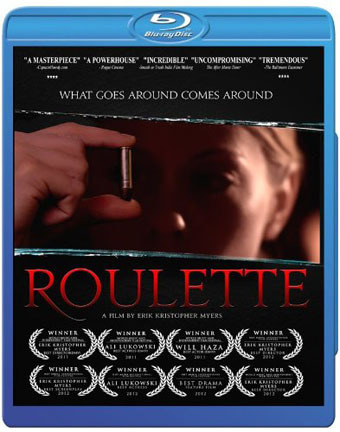 Also, did you know that the incredible movie ROULETTE – by filmmaker Erik Kristopher Myers – is coming out on Blu-ray on October 22 and on DVD on November 19th? Well it is peeps! This is the movie that rocked the independent film world. Make sure you pick it up HERE. I am extending the contest date on the Rise and Fall… in Love DVD/poster contest. Why? Because the BIG WORLD PREMIERE is coming for this movie! 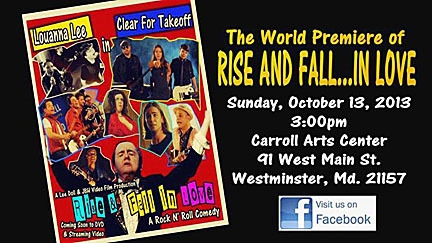 Lee Doll’s independent musical “Rise and Fall… in Love” premieres on Sunday October 13, 2013 at 3:00 pm at the Carroll Arts Center in Westminster, Maryland. Tickets are selling quicker than anticipated so please tell your friends, family, and Significant Others to purchase their tickets soon HERE – be there! And the drawing for the free DVD and poster will be done THAT DAY!!! ALSO! Lee Doll Film Productions and JBH Video present: “READY FOR ACTION” Now in Pre-Production! “Ready For Action” has been 99% cast and will begin filming late Fall 2013. The film stars Jennifer Rouse of Dangerous Deception, Chainsaw Sally, and One-Eyed Horse. “Ready For Action” centers around the female operatives of the Sweet Cascades Agency run by Candy West (Kate Jackson). Sweet Cascades Agency is hired to find the kidnapped little girl of Mr. Reason, portrayed by cult-star George Stover. Rounding out the detective agency is martial artist Claire Brown and pop-star Louanna Lee. Here’s the TEASER TRAILER. Other cast members include: Alexandra Hewett • Sam Lukowski • Alfred Guy • Kim Hoang • Wayne Shipley • Karl Hopf • Brendan Biondi • Avery Guy • Julius Bennett, Jr. • Gene Vincentt – We are still searching for a 10 year old girl for one day of filming. Contact Kate@leedoll.com for more info. Filmmaker Joe Sherlock is on the mend from his car accident and had this to tell us: I am just about finished with my latest, DRIFTER. Some music and sound work and a few visual FX and it’ll be done. Here is the latest TRAILER and the Facebook page with lots of pics is HERE. I got an email from a gentleman named Nathan Seim. He is an engineer at ATOMIC FEATHER. 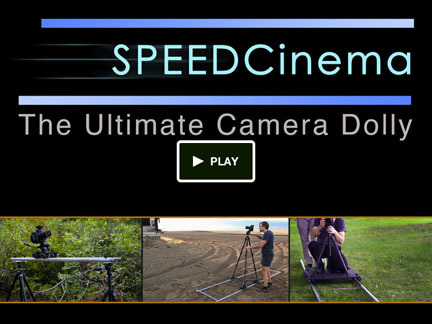 This team makes lightweight rigs and dollies for independent filmmakers. I think they are fantastic! They have a kickstarter going on for some of the newer equipment they are developing. Only ten days left on that kickstarter so give them a look – really talented team! It’s giveaway time again!!! 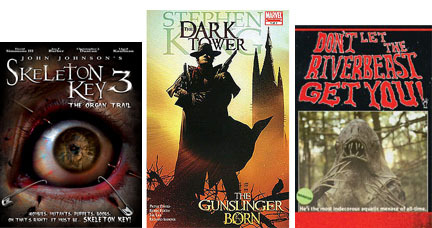 We have a couple of DVDs – Skeleton Key 3 by John Johnson Don’t Let the Riverbeast Get You (by Matt Farley and donated by Jon Cross) and a Stephen King book Dark Tower – The GunSlinger Born (donated by filmmaker Kevin Kangas). So if you are interested in getting one of these, send me your name and address to rembrandt36@earthlink.net. I’ll be doing a drawing for them at the end of August. 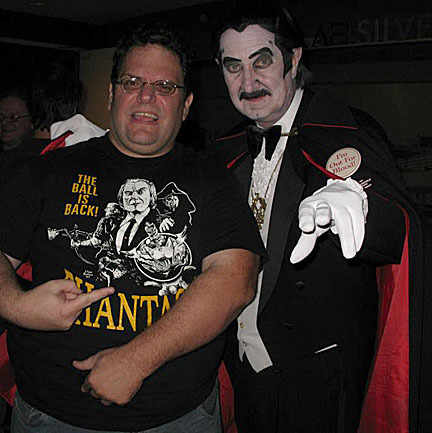 A sincere thank you to Les Bradley and Leanna Chamish of this great photo of me with Count Gore De Vol at the PHANTASM showing at the AFI Silver Theater. I was able to chat with John Dimes and movie reviewer Judy Furlow. Good times – good times. Edward L Plumb’s new short film DEAD RECKONING will be at Mann’s Chinese Theater Saturday night – August 17th, at the MIDNIGHT MADNESS show. Midnight showing at Mann’s Chinese Theater on Hollywood Blvd. Stars Marlene McCohen, Tim Thomerson, Robert Woods and Richard Hatch. 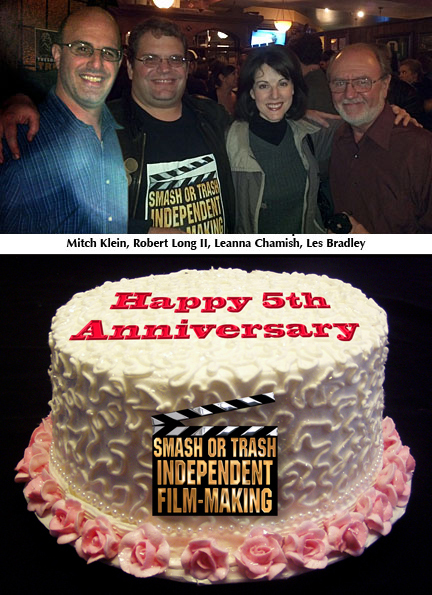 Welcome back to the 5th Anniversary of Smash or Trash Indie Filmmaking. Thanks for sticking with us these many years, and we hope to get more goodies posted here in the very near future. My thanks to Mitch Klein, Leanna Chamish and Les Bradley for all their help here at Smash or Trash. NEW POST PRODUCTION ARTICLE UP! Wow, it’s been a while since I have done a serious update – but it is up now! I have a new post production article up on what the next possible step is before going to distribution or self distribution; going to a video post house to get a limited number of copies professionally made. Therefore the spotlight falls on a Mid Atlantic firm known as VIDEO LABS. This company has had a LOT of interaction with independent filmmakers. The link for that article is HERE. Movie Reviewer Judy Furlow Grannas has a new review up for a GOOD movie – ABSENTIA. By all accounts this sounds like a movie everyone is going to want to check out! The link to the review can be found HERE. Wow! Going into the fourth year of Smash or Trash. What can be said? Well, I’m incredibly lucky for being involved with such a great bunch of people worldwide. Leanna Chamish and I set out to do a book many years ago, but saw that the web was the way to go to keep things current. Mitch Klein came on board as an incredible supporter, and now we have Judith Furlow and Les Bradley on the team as well. My friend producer Frank Lama has moved to Toronto Canada, but we still consider him an honorary member around these parts. Independent filmmaking is a lot like life; incredibly passionate, difficult, and insane. Why do we do it? Because it is a drug in our system. Because we are both smart and very stupid at the same time. Because we have something inside of us that won’t quit, no matter how much we crave sanity. For better or for worse, we are wed to the camera. I’m not going to get into a big speech here. I would just like to say that there is room for improvement at the site. Little by little we are getting there. We hope to also do another Smash or Trash episode, and maybe get a podcast going. I want to sincerely thank everyone behind the scenes for their incredible love and support of the site. It would be nothing without you. I want to thank the viewers for increasing in number and for the positive feedback they give us. A very special thank you to the After Movie Diner podcast for all their support from the great city of New York. And a very big shout out to legendary actor George Stover because he is awesome and we all love him to pieces here at Smash or Trash. May you rock on for many more years in the movies George! So keep coming back. I hope to get a lot more cool interviews, reviews, and how to’s up on the site soon. A First Look at Smash or Trash TV! Saturday February 5th was the launch of Smash or Trash TV. There is just something unbelievably cool about seeing a dream become a reality. Smash or Trash TV is making its home at the fantastic (and affordable) Blue Omega Entertainment Studios in Annapolis, MD. I will post a LOT more about the experience here in the next week, but here are a few photos from the day courtesy of Les Bradley, Louanna Lee, and Lee Doll. My thanks go out to Frank Lama (my co-host and co-producer), my great guests, and a damn terrific crew! This television program is in the works. Three initial episodes will be produced in January with several guests and guest hosts. The focus will be to bring attention to talented indie filmmakers, as well as helping all filmmakers make better films on a limited budget. It will start with regional East Coast movie makers, and with some good will it will continue and branch out world-wide. The format will include interviews, reviews of independent movies, and how to do super movies with limited means. 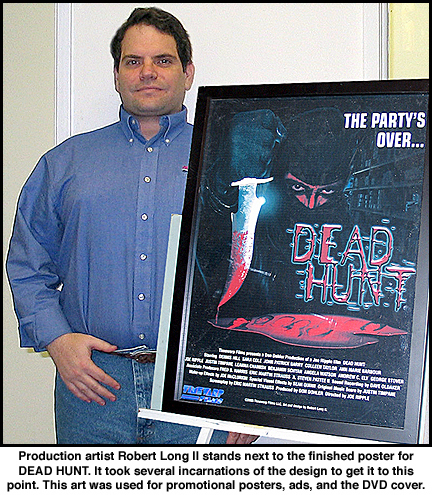 It will be produced by Frank Anthony Lama (Fear of Clowns movie series, Swarm of the Snakehead) and the host will be Robert Long II (Founder of Smash or Trash Independent Film-making). UPDATE: Had a 4 hour meeting with Producer Frank Lama last Saturday, and it went great! We went over the list of possible guests, topics, themes, and format. This is an exciting opportunity that we hope comes to fruition! If the schedule works out we will be going behind the scenes of filmmaker Kevin Kangas’ new movie GARDEN OF HEDON – too cool. More details as they are available. Coming up: Reviews, reviews, reviews!!! Guest reviewer Amanda Reyes will be giving us the breakdown of “Lovin’ Fool” the latest episode of the Adventures of Louanna Lee. I will be getting up the reviews for Erik Kristopher Myer’s ROULETTE, Endlight Entertainment’s NINJAS VS VAMPIRES, and Robert Hatari’s THE MURDER GAME. There is much more coming down the pike, so stay tuned! Smash or Trash Merchandise Now Available! Smash or Trash now has merchandise available! You can now get coffee mugs, hats, t-shirts, water bottles, hoodies, and many other items that sport our cool and unique logos, designs, and emblems. 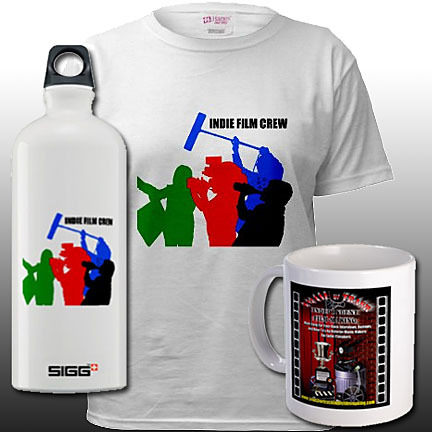 These are the perfect gift for yourself or for the independent movie maker in your life. Plus every purchase made goes towards keeping the site and content coming fast and strong for years to come. Click on the image above to go to the new store!